Five family hooplas, 24 hours behind the wheel, and three skillion cookies later, Ben and I are back in Madison after celebrating Christmas with my family in Wichita, KS. This was our first holiday spent together and, with his dish-washing prowess and unabashed appetite, Ben rapidly endeared himself to his new in-laws. Upon our return, we promptly dumped the contents of our suitcases into the laundry hamper, tossed the leftover pecan bars in the freezer (yes, I drove dessert from Kansas), and went out for a hearty dinner. When you’ve been eating over-the-top meals for six days in succession, what’s one more? Speaking of one more, despite the indulgence of the past month, the festivities are not over yet. Our chain of winter holidays ends with a beginning: New Year’s 2013. Whoa, 2012, where did you go? As I play a mental slide show this past year, set to Coldplay’s “Clocks” (Does anyone else find this a slide show musical must? ), it appears that I’ve been busy. Images of marrying Ben, quitting my job, changing cities, finding a new job, traveling through Greece, and starting (and maintaining) a certain blog brightly dot the past 365 days. These 2012 milestones contrast with the quiet scene of the moment: Ben and I lounge contently in our ever-shrinking apartment. The tree is lit, because it’s still December and why not? A football game plays in the background. Later, we’ll finish the movie I fell asleep watching last night. A wild pair we are indeed. At some point, I’ll make my resolutions, renewing my annual pledges to patience, to kindness, to quitting my cuticle-picking, and to consuming a teeny-tiny bit less refined sugar—except for rewarding myself with chocolate when I progress in my other resolutions, of course. Today, however, is 2012, and I am taking it easy. Do the same. The past several weeks have been packed with shopping, cooking, cleaning, eating, and digesting. The last thing that you and I need is another night to stress about what to cook. Friends, I have you covered. Swap your fussy appetizer plans for Whipped Feta Crostini. Whipped Feta Crostini is your New Year’s Eve BFF. A delightful combination of crispy French bread and creamy feta cheese, Whipped Feta Crostini takes literally five minutes to prepare and is endlessly adaptable. 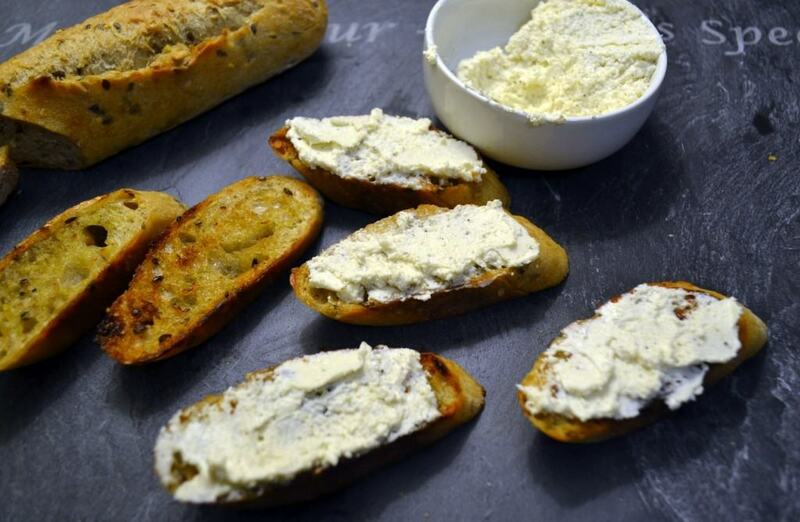 The saltiness of the whipped feta tastes fabulous against the olive oil-brushed and toasted baguette pieces. Spread it and stop. 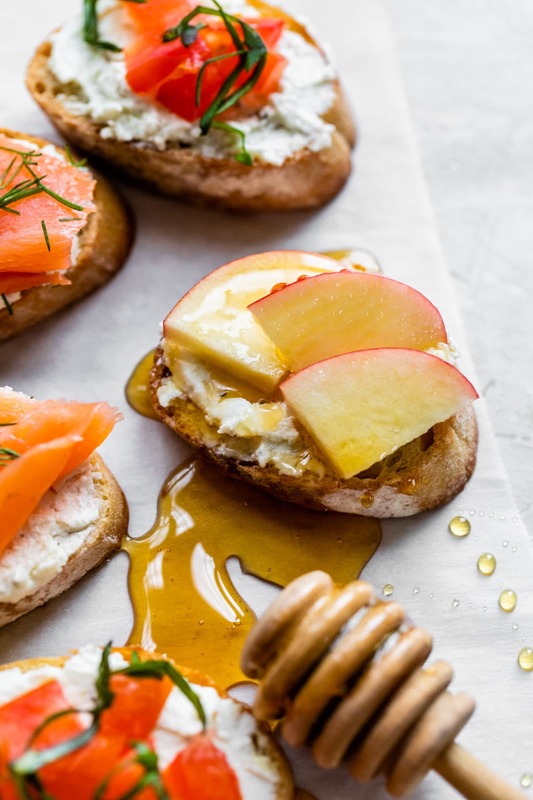 Your guests will love Whipped Feta Crostini and, more importantly, you as is. But perhaps you want love AND undying affection. Perhaps you want a sneaky way to make one appetizer look like six different appetizers. Whipped Feta Crostini is your answer to both. Ta-dah! One recipe, six distinct hors d’oeuvres. Now give yourself a high five and pour another glass of champagne. You’ve earned it. Wishing you all a peaceful end to 2012, a bubbly beginning to 2013, and an extra serving of Whipped Feta Crostini. Let’s celebrate! Heat a griddle or large skillet over medium. In the bowl of a food processor, whip feta for 30 seconds. Add milk or cream and black pepper. Whip again until creamy and fully combined, about 1 minute. In a small bowl, combine olive oil and minced garlic. Brush onto each side of bread slices, then place the slices onto the heated skillet, toasting until golden brown, about two minutes (watch carefully—every skillet and stove is different). Flip bread and toast the other side. Spread the whipped feta mixture onto one side of the toasted bread. Serve warm or at room temperature. Make Ahead Tip: The whipped feta topping can be prepared a day in advance. Refrigerate in a tightly sealed container, then toast and top baguette pieces just before guests arrive. genius…our family loves feta and bread! We had two types of this over Christmas…glad you guys had safe travels…Have a happy new year! Beautiful wedding photo – and whipped feta sounds delicious! Thanks so much! My little sis gets full photo credits on the pic. Hope you enjoy the feta and wishing you a very Happy New Year! Thanks Abby! Happy New Year to you and hope you enjoy. Really, you can’t go wrong putting feta on pretty much anything! Thanks Maggie. Wishing you a very happy new year! Thanks so much Jess! A very Happy New Year to you!